Two great Scottish preachers writing on the titles of Christ? Sign me up! Authors Sinclair Ferguson and Alistair Begg have a lot in common, but also significant differences. Both are from Glasgow and, at the time of writing, live in the USA (Ferguson is moving back to Scotland). They are childhood friends and share many interests such as golf. However, Begg is a Baptist and Ferguson a Presbyterian. I wonder about the conversations they’ve no doubt had on infant baptism. This seems not to have caused any significant tensions between them, their friendship remains strong. It’s their love of Christ that unites them, and they have come together to meditate on the wonder of Jesus in Name Above All Names. In each chapter, a title, along with the impact for the person and work of Christ, is developed. Most chapters freely move around the Bible to give a wide-angle view and pull together all the various pieces. Originally given as talks at the Second Presbyterian Church in Memphis, this book has a sermonic and devotional feel. This is the profoundest of theology made accessible and applicational to all. In the first chapter we see Christ as the promised Seed who would crush the serpent’s head. This thread is traced throughout the whole of Scripture with some very profound insights made along the way. The next three chapters explore the titles and offices of Prophet, Priest, King, and how Christ embodies each of them. In what is possibly my favourite chapter, the title Son of Man is expounded upon, beginning with Daniel 7 and then Christ’s self-designation in the Gospels. Christ is then seen as the Suffering Servant and sacrifice for sin. Then the final chapter dwells on Christ as seen in Revelation and pulls everything together. In the introduction the authors acknowledge that this is not an exhaustive examination of Christ’s titles, but I was still very surprised that the title “Lord” was not given its own chapter. This is particularly surprising since this was likely “the name above all names” that Paul had in mind in Philippians 2:9, the same verse that served as inspiration for this book’s title! In Christ’s exaltation, He was recognized as God, the one who spoke the words in Isaiah 45:21-24. This would have been a wonderful chapter. I suspect the chapters are predominantly written either by Ferguson or Begg if the original talks inspiring this book are anything to go by. I think this is confirmed by the fact that I found the odd chapters (Ferguson’s) more profound than the even chapters (Begg’s). Begg’s chapters felt a little overly structured, with a lot of alliteration and neat organization. His chapters were still very enjoyable and full of wonderful insights, but Ferguson’s were like a feast. His chapters stayed closer to text of Scripture and probed my heart deeply, taking me to the next level in praising Christ. This is probably purely subjective, and I suspect others will have the opposite experience. Perhaps this is a strength of the book? This is not a dry theology book. The authors are clearly enamoured with Christ and their devotion to Him is present on every page. The reader is constantly pointed to action, what will you do with this information? What will you do with Christ? One of the more surprising aspects of this book is the number of (mostly obscure to me) hymns quoted, with at least two per chapter. This was another factor that helped keep the content close to the heart and not just in the head. 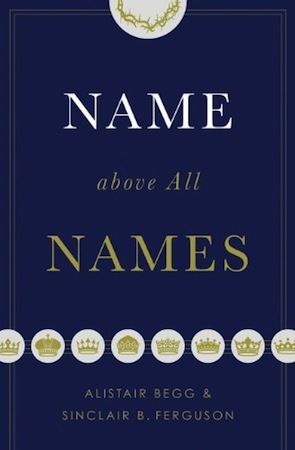 Each chapter of Name Above All Names is a rich exploration of the greatness of Christ and His work. My most significant criticism is that this book ended. I would have greatly enjoyed additional chapters, the content was so good. I have a particular interest in the titles of Christ, but anyone would benefit from the insights in this book. We all need to know and love Jesus better, and meditating on His person and work cannot leave one cold. Thank God for men like Begg and Ferguson and for books like Name Above All Names! Many thanks to Angie Cheatham and Crossway for providing a review copy of this book in return for a fair review.